Our PNAS paper on how "Metabolic theory predicts ecosystem properties" just came out. In it, we present theory that integrates metabolic (organism-based bottom-up) and systems (ecosystem-based top-down) approaches to characterize how the metabolism of individuals affects the flows and stores of materials and energy in ecosystems. Our approach provides a powerful way to understand the roles of organisms in ecosystem processes at scales from local habitats to the biosphere, which is required for addressing the impacts of human-caused changes in climate, land use, and biodiversity. 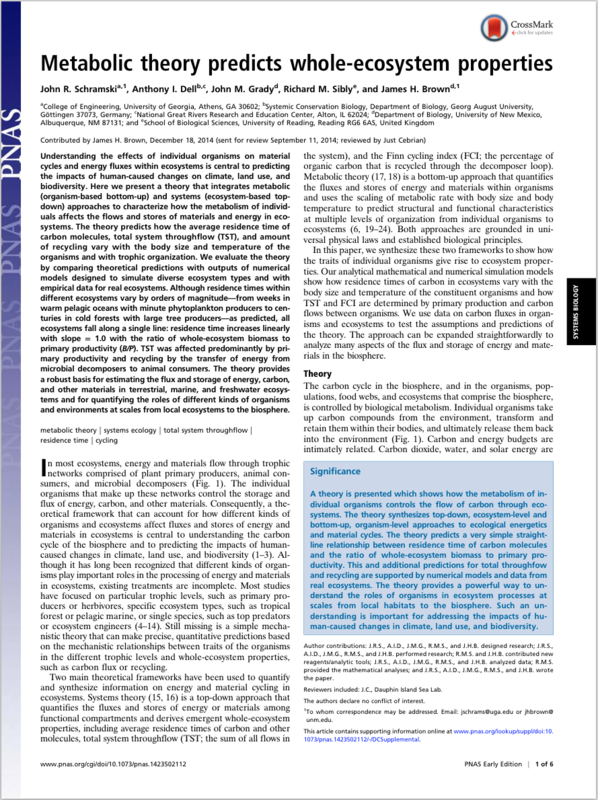 View this paper on our PUBLICATIONS page.